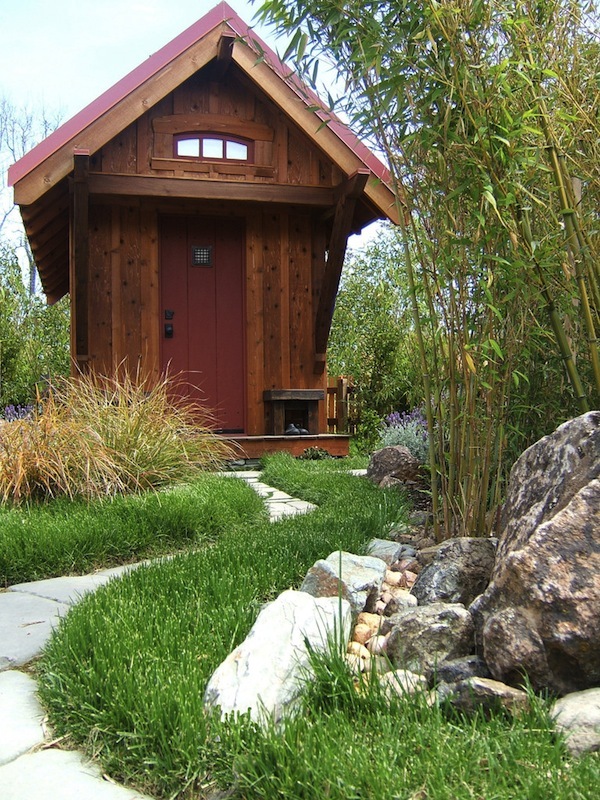 The primary reason why Beth decided to build and live in a tiny house was trying to downsize. She sold her 2-bedroom house and moved into a much smaller apartment while she finished up the tiny house. 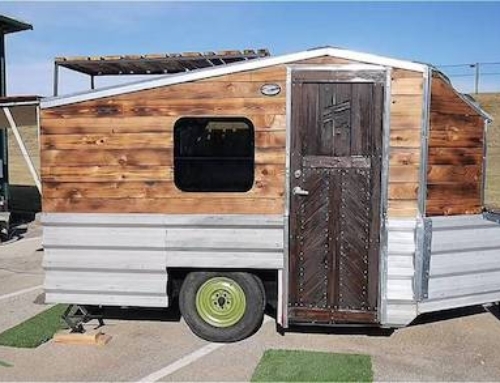 By her estimation it will only cost $25,000 to build her tiny house, which includes the custom made trailer on which it rests. 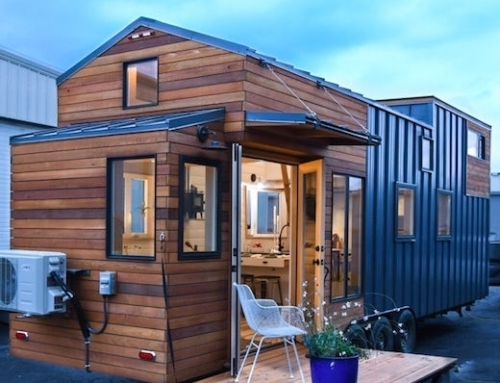 The shell of the tiny house was constructed in five days during a workshop Beth attended at MAGIC Camp in Camarillo, California. At the end of the camp, she also already had an insulated sub-floor, framed exterior walls, a framed roof, house wrap on the entire house, and exterior sheathing. The front door of the house was custom designed, built, and installed by Daniel Bell Construction in Thousand Oaks, California. The tiny house also has a standing seam metal roof, which was installed by Clark Louver Company, Inc. of Fort Worth, Texas. All the windows also had to be custom made to fit the dimensions of the home, and Beth opted for Marvin windows (both casement and awning) which she purchased from Omniview Window & Door in Fort Worth, Texas. She still needs to finish up the interior, but is hoping to move into her new home soon. The house will have a small kitchen, a loft with a skylight as the sleeping area, and a living room. The electrical installations are currently underway, with plumbing to follow. The house will have two water reservoir tanks mounted under the trailer, namely a fresh water tank, and a gray water tank. The tanks will be connected to a water pump and heated by an electric tankless water heater. The house will also have a composting toilet. Electric heat will be provided by a convection heat Envi electric wall panel, while Beth is not planning to install an air conditioning unit, but is instead opting for two oscillating fans near the ceiling for air movement. Electricity will be provided via plugging it into a power source, though she also plans to install solar panels in the future. Beth is also busy planning a tiny house community in the Dallas area, similar to the Tiny House Village thought up by Jay Shaffer in California. The biggest obstacle for such a community is complying with all the local building codes. 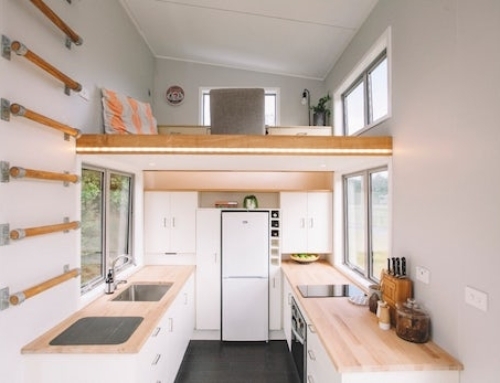 Her vision is to build the tiny houses looped around a central community, as well as provide a few extra tiny homes that can be rented out to people in need, or those who just want a taste of tiny house living.